UNIVERSITY PARK, Pa. — A Board of Trustees committee approved the appointment of Payette of Boston, Massachusetts, as the architect of two new research and teaching buildings for the College of Engineering. The proposal was approved by Committee on Finance, Business and Capital Planning on Feb. 22. Payette was selected based on its work with similar projects, including the Science Center at Amherst College, the Interdisciplinary Science and Engineering Complex at Northeastern University, and the Cancer Institute and Children's Hospital at Penn State Health Milton S. Hershey Medical Center. The total project cost of both buildings is $312 million. The University and the Commonwealth of Pennsylvania are funding much of the project, and a capital campaign is underway to continue project support. The buildings will become the anchors for a re-imagined West Quadrangle on the University Park campus, defined by Leonhard Building to the south, Applied Science Building to the east, and Earth and Engineering Science to the north. The College of Engineering was established at Penn State 123 years ago, and it has seen significant growth over the last decade. Today, the college enrolls more than 12,000 students, with nearly 50 percent more undergraduate students than just 10 years ago. In fiscal year 2018, the college’s research expenditures exceeded $130 million — the largest research portfolio of any of the Penn State academic colleges. According to Schwartz, the two new buildings will help mitigate the college’s most pressing space limitations, as well as provide an opportunity to develop state-of-the-art infrastructure to support research. The first building, currently known as West 2, will provide approximately 98,000 gross square feet to be used as flexible classrooms, multi-use design studios, “cornerstone to capstone” maker spaces, high-bay research labs, faculty offices and research cores to benefit multiple engineering disciplines. Construction is expected to begin in October 2020. The second building, currently known as West 1, will be approximately 279,000 gross square feet. 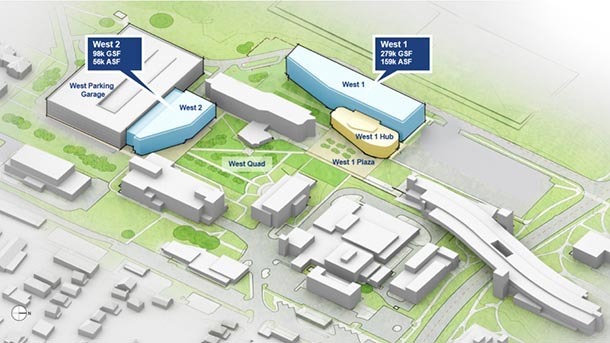 In addition to incorporating similar features and facilities from West 2, West 1 will also house knowledge commons with collaborative student work space, departmental administrative and faculty offices and research laboratories, food service and pedestrian connections to position the building as a welcoming and active university hub. Construction for West 1 is expected to begin in March of 2021. The buildings will specifically accommodate students and research in aerospace, architectural, acoustic, and civil and environmental engineering, the School of Engineering Design, Technology and Professional Programs, and student advising and support services, according to Schwartz. He also noted that both buildings will be designed as high-performance facilities with a commitment to environmental sustainability.